An 82 year old Wisconsin man had been missing for three days. Search dogs, helicopters and hundreds of volunteers searched for him without luck. The elderly man has dementia and was believed to have been without food, water, or shelter for three days. 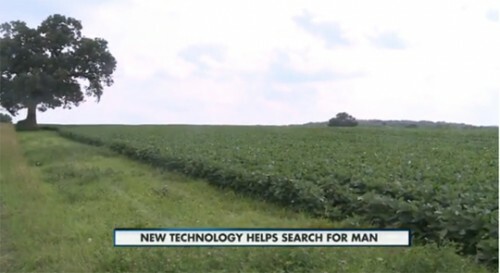 The fear was that they would find a body, but he was finally located by a drone with camera in a 200-acre soybean field. The elderly Wisonsin man was OK, but dehydrated. This was reported by a local TV news show who interviewed David Lesh the drone pilot http://www.nbc15.com/video?videoid=2889185. Another drone company called EquuSearch uses small drones to find missing persons. They stopped doing business for legal reasons, but just resumed operations after a minor courthouse victory against the FAA which regulates US flights. According to Brendan Schulman, EquuSearch’s attorney, “In the litigation, we were not presented with a credible argument showing that humanitarian use of model aircraft is illegal. I cannot predict what the agency will do, but I hope they will recognize and embrace this safe and beneficial use of the technology.” The FAA says the the legal decision — which was based on a technicality without the merits being decided — “has no bearing on the FAA’s authority to regulate” the commercial use of drones. It’s not the first time in history for narrow-minded unthinking regulation to be imposed and neither will it be the last. No problem with sensible regulation – all you have to do is regulate for problems related to safety and privacy. What’s the big problem? Is it about power? All this does is question the worth and value of the FAA and like bodies.